Ray Harryhausen would undoubtedly be smiling. Rampage, the 2018 Warner Brothers release starring Dwaye "The Rock" Johnson, is an old time, rock 'em sock 'em monster flick that hearkens back to such glorious titles as King Kong, 20 Million Miles to Earth, Godzilla and many others. It's also the latest movie to appear that's based on a game. This time, however, it's based on an old arcade-type, freestanding console game in which you control a horrible monster that's wreaking havoc on an "old tech-graphic" cityscape. 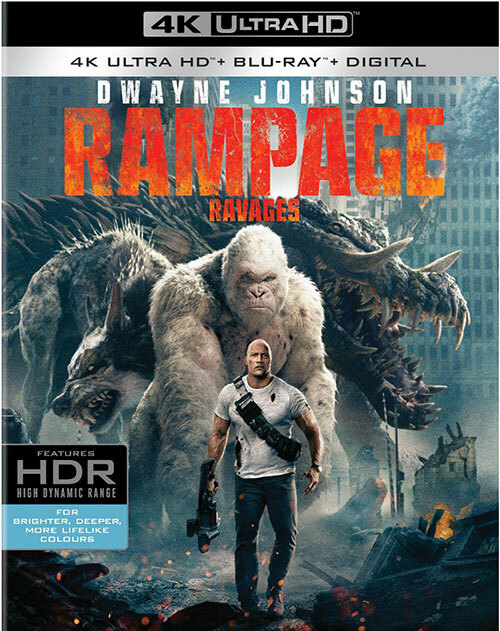 I'd never heard of Rampage before this movie, despite my video gaming and generally nerdy past, but according to the supplements on the Blu-ray that accompany this terrific 4K HDR disc, Rampage appears to have been kind of analogous to what a Wreck-it Ralph game would be were Ralph the "hero" instead of the bad guy. Not my idea of a game, but Johnson and a good part of the cast and crew wax nostalgic for all the quarters they dropped into the consoles 'way back when - and their affection is contagious. The love for the project comes through in nearly every shot of the movie, too, and unlike the last game-based 4K movie I reviewed (Tomb Raider), this one's inevitable computer graphics are top notch. I credit the movie's budget ($94,000,000 for Tomb versus $120,000,000 for Rampage, according to estimates from IMDB) as well as the producers' choice to hire Weta Digital, the New Zealand-based special effects powerhouse that first came to acclaim with Peter Jackson's Lord of the Rings trilogy. Perhaps even more relevant to Rampage, with its giant albino gorilla, is Weta's work on Jackson's King Kong remake and its rendering of Caesar from the Planet of the Apes reboots. And as with Kong and Caesar, the producers used performance capture to create the gorilla George (what a curious name for a simian character!) and that brings a true sense of realism to the CG character that replaces actor Jason Liles). George, the albino gorilla, is a resident of the San Diego zoo, under the watchful eye of Davis Okoye (Johnson, of course), an ex-military guy who also just happens to be a primatologist. George can communicate via sign language and has a rather interesting and offbeat sense of humour. Alas, Big Pharma (or Big Science or just Big Bad Capitalism) has perfected a system of genetic editing that the U.S. government (yep, those always-trustworthy folks) has designated a "weapon of mass destruction and proliferation" and outlawed. That, of course, doesn't stop the bad businesspeople from doing the work in secret, on a space station. But when the space station is destroyed, a few canisters of the "editing software" plummet to earth like the supposed Rods from God, one of them (of course) landing in George's enclosure. The poor ape breathes in some of the green stuff that emanates from the crash site and our movie officially gets under way. The stuff changes its host, making it grow larger and more aggressive (and what else it does, if anything, we don't know yet), and the next thing we know the U.S. Government (yep, those always-trustworthy folks) are muscling their way in, trying to – well, we think they might be trying to keep neo-George under wraps but one can never quite tell when dealing with Hollowwood government agents, can we? Making things worse, two other animals got zapped as well, a wolf in Wyoming and a crocodile in the Everglades, and they appear to have gotten larger doses of the ill-gotten booty because, while George doesn't really stop being a gorilla at heart, these other critters develop capabilities beyond just getting big and aggressive. Before all is said and done, we get to see downtown Chicago laid waste (never been there, but I understand this may not be a bad thing in the grand scheme of things), and some really great action sequences coupled with some nifty military hardware, fantastic stunts, and – well, you get the drift. It's all quite silly and quite unbelievable (or is it? Hmmm?) and I loved very nearly every second of it. There is a bit of a slowdown for a couple of shorts moments of angst that explain Johnson's character's back story and another when things stop for his sidekick Kate Caldwell (Naomie Harris) to outline hers. But they're mercifully brief and at least we get some insight into why a big "man of action" is tending apes. I'm a sucker for a good monster movie, but good ones are few and far between. Last year's Kong: Skull Island was okay, as was the last Godzilla, but this one is head and shoulders better. And it never takes itself too seriously, which is a bonus in a flick such as this. Heck, I laughed out loud multiple times during the story, usually during scenes of maximum danger! The cast is terrific. My favourite backup actor was Jeffrey Dean Morgan as a government agent who uses a smile as his umbrella and who actually turns out to be not as bad a guy as he'd be in most movies like this. And I loved seeing the A-10 Warthog, the helicopters, the F-18's – and as a pièce de résistance, a B2 Stealth bomber! I was in heaven! Weta's work is spectacular! Not only do the monsters look and move beautifully and realistically, all the digital work (buildings being destroyed, etc. etc. etc.) was seamless (maybe some flaws will show up on subsequent viewings, but not the first time through), and the audio soundtrack is as big and bombastic as a movie like this calls for. Yeah, we've seen cities laid waste a million times now, and it gets a bit much. But Rampage didn't make me sit there and point at shots and go "been there, done that!" at all. They've truly made the concept as fresh and interesting as possible for an idea that, really, goes right back to the early days of cinema. There are homages throughout the film, including a couple from the Rampage game that I didn't get. But I got one that maybe even the producers didn't know was there (does that still qualify it as an homage or easter egg? ): George is kept sedated exactly the same way the U.S. military kept the Ymir from Harryhausen's 20 Million Miles to Earth, except that in the earlier movie they used electricity (because that's what worked on the alien creature) instead of the more conventional sedative used here. So, yeah, set your inner nerd free and spend a couple of hours letting Rampage wash over you. The best way to do that is with this exquisite Warner Home Video 4K UHD disc. The picture, which also features Dolby Vision HDR, is superb. The image is razor sharp, with no grain and it looks astounding. You can make out the individual hairs (or scales) on the critters, practically count the pores on the thespians, and count the tiny grains of concrete that end up littering the Chicago cityscape. It's a really top-notch presentation. Audio is Dolby Atmos but if you're like me you still only have a 5.1 system and, for such systems, it downgrades itself to Dolby TrueHD. There's also a DTS-HD Master Audio 5.1 track and that's the one I used – and to great effect. As you'd expect – or at least want – the audio is loud and brash and mixed around the listening room to terrific effect. Each of your home theatre channels will get a nice workout, with sonic performance that's as good as the excellent video. You also get a decent set of extras, though as is usual with the 4K discs I've auditioned they're only on the Blu-ray that's also in the box (there's a digital download code included, too). The extras cover the evolution from lousy graphics video game to fantastic CGI movie, how the actors and crew pulled off the great stunts, the design of the monsters, how they managed to destroy Chicago without really destroying it (and no, it isn't a Democrat party newsreel) as well as the process of bringing George to life via performance capture/CG. There's also a gag reel that Warner Brothers' promo material say is hilarious, and some deleted scenes. I had no idea what to expect going into the Rampage review, though I didn't expect much. Yet I was delighted with the film. As a long-time monster movie buff, I wanted to like it, but have been disappointed so many times before I didn't expect I would. But I loved it! As I said at the top of this piece, I think Ray Harryhausen, the genius behind such monster movie classics as Jason and the Argonauts, Clash of the Titans (the original, not the awful remake) and The Golden Voyage of Sinbad, would approve. And this 4K disc presentation is definitely the way to go if you want to see Rampage in all its glory.